Great minds think alike! You already found out what Nick got for me, now let me tell you a little story about what I got for him. 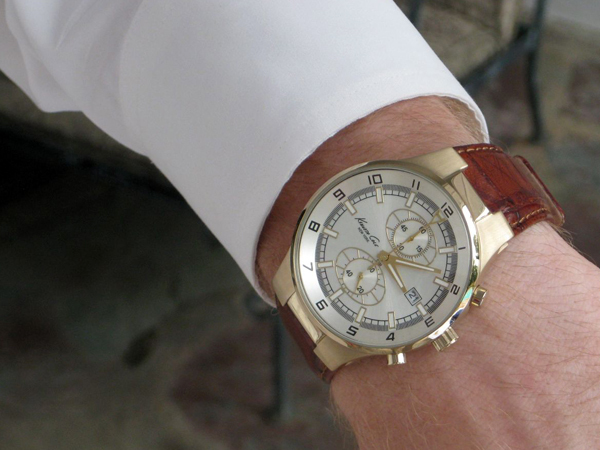 Nick had been wearing the same watch for eight years. And he took it from the lost and found, located in the dorm where he was an RA, after it went unclaimed. Yes, it’s a Bulgari, but he was due for a new one. Let me tell you something else about Nick. He’s a picky shopper. From shirt collars and tails to tassels on shoes, he analyzes every detail of a purchase before he makes a decision. I’m not saying this is a bad thing, I’m just saying it makes it hard to shop for him! I had encouraged him to look at watches with me on several occasions — at both fine jewelery stores and department stores. Leather or linked band? Thin or wide? Silver or gold face? Big or small? He just didn’t know. But he did mention quite awhile ago that he really liked the Kenneth Cole watch that my brother owned. I stored away this important nugget of information for later reference. 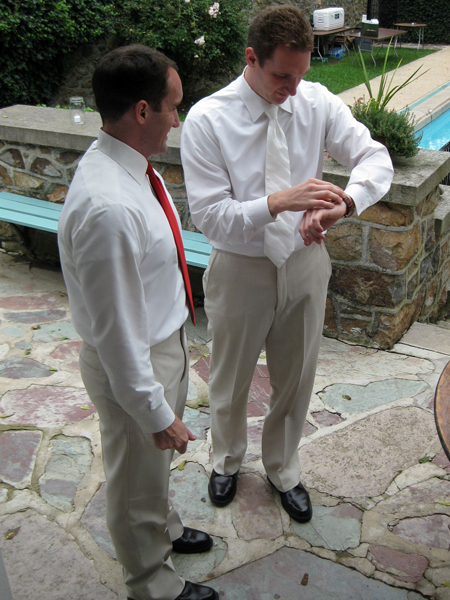 So when the time came to choose a gift for my groom, I got the details on the Kenneth Cole watch from my brother. I was just about ready to place the order when Andrew called. He said Nick was trying to buy the watch from him. What?! Why do boys try to barter? When Andrew said no, Nick said he was going to have to buy it for himself then. Nick called me the following day to tell me he was going to stop at Kenneth Cole on his way from New Jersey to Pennsylvania. I played dumb and asked what for. He told me he wanted to buy the watch. As casually as I could, I suggested he not buy anything like that so close to the wedding. “Emmie,” he said, “you didn’t buy a watch for me, did you?” And, “You know how picky I am.” Yes, dear, I do, which is why I got you just the watch I knew you wanted. Of course, I didn’t say that to him. I just said to wait until after the wedding. If he didn’t get something he liked, he could return it. So imagine his surprise when he opened the watch on our wedding day! I wish I could have been a fly on the wall. It really is a good looking watch. It goes well with jeans and suits alike. And I had it engraved with “To the Love of My Lifetime” and the date. Coincidentally, we had both watches engraved by the same shop. I bet they had a laugh! 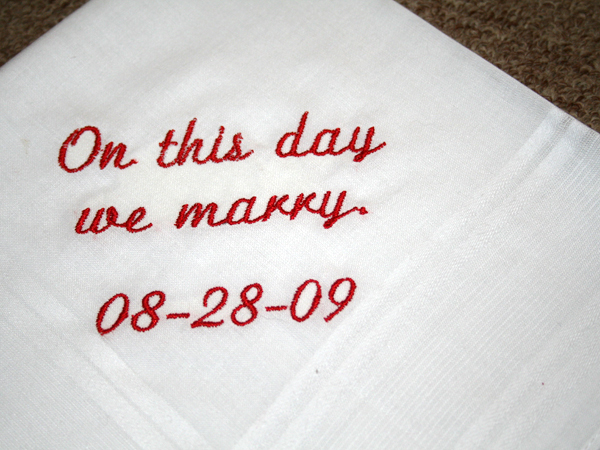 I also gave him an embroidered hanky. I’d expected he’d have to use it to wipe sweat from his brow on a sticky August day. But, rather, he used it to dry raindrops from his face and hands. Regardless, it was useful! And quite charming. Next: My favorite flowers in my favorite colors arranged by one of my favorite gals. This is so funny, Emily! Steve never fails to buy himself a “gift” right before a special occasion (not knowing that I had already bought it for him).